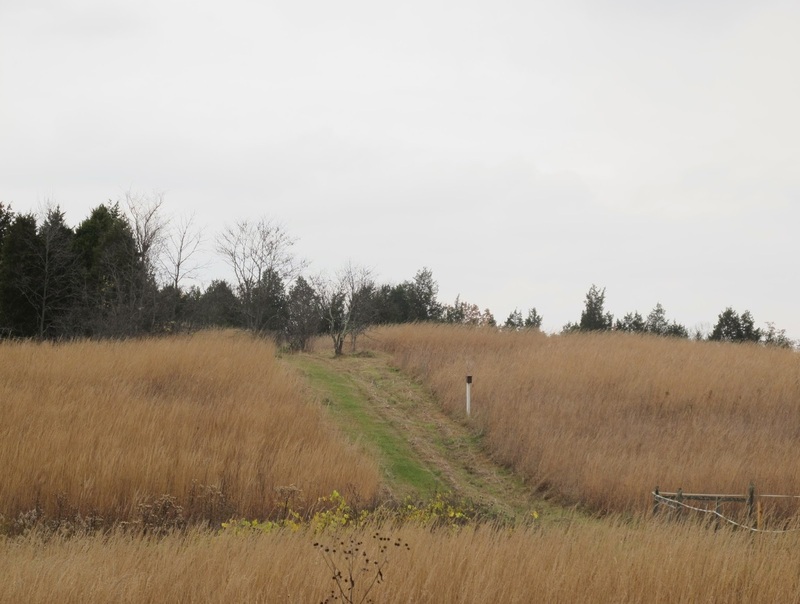 Mowing season begins in November for the evolving prairie developing in the former crop fields. 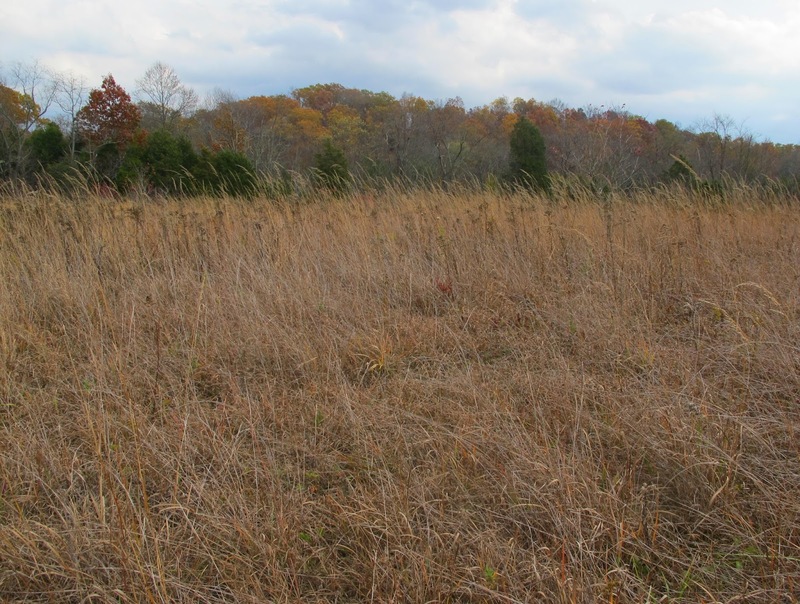 This field represents 7.5 of the approximately 8.7 acres that will be mowed this year. 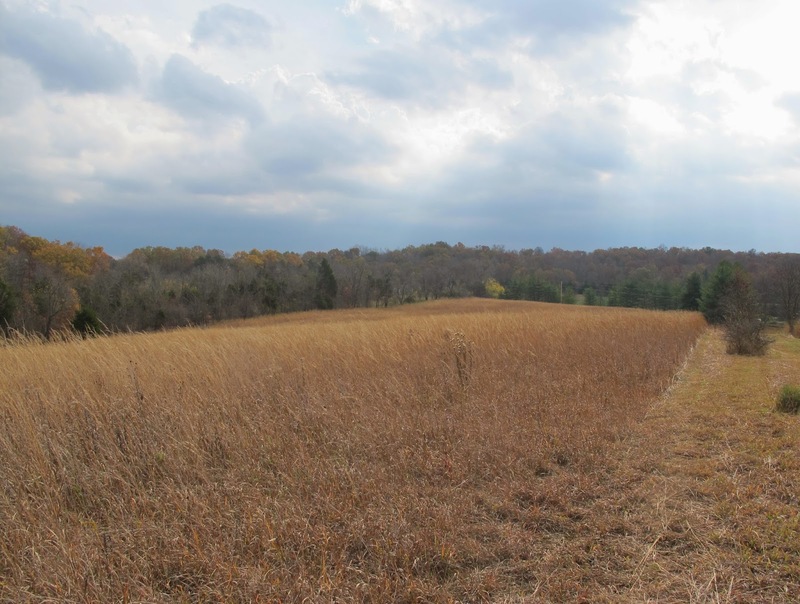 The total amount is roughly a half acre more than what was mowed last season. It has been five years since this area was last mowed. 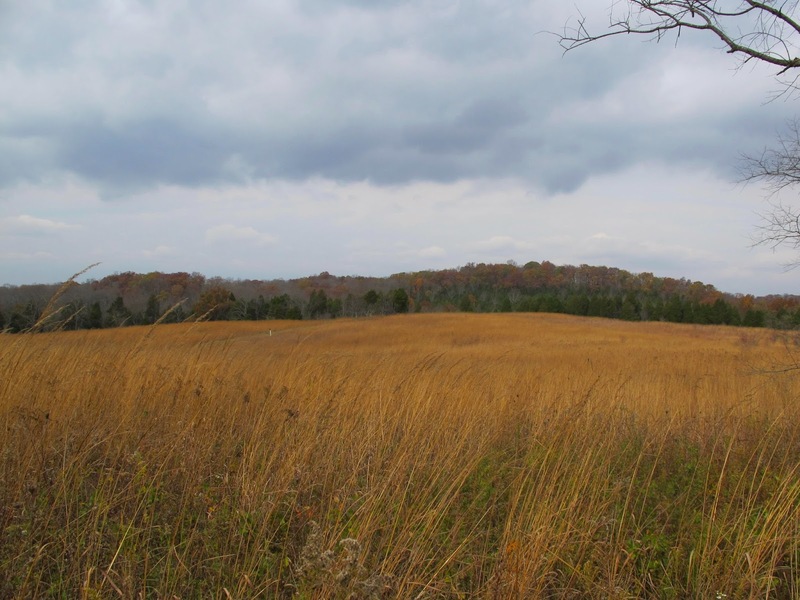 The area was thoroughly searched two years ago to locate and cut pioneering young Eastern Red Cedars. 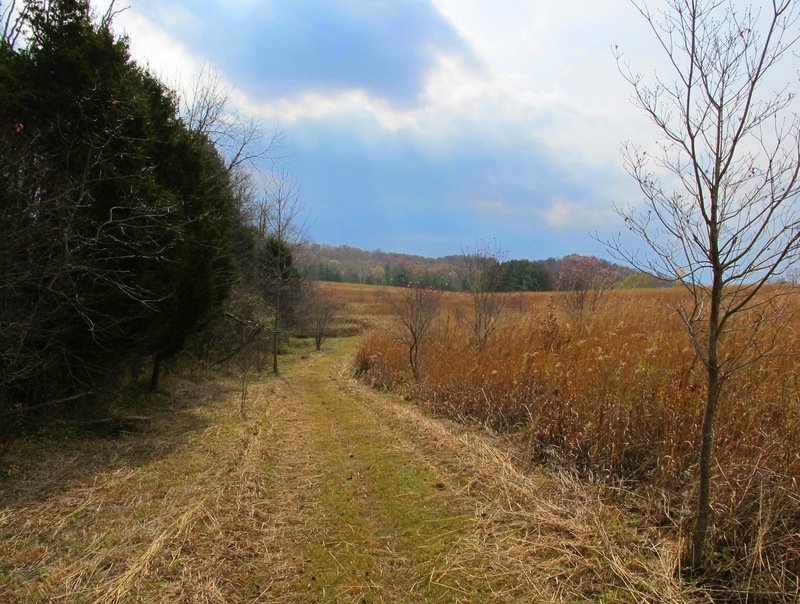 Last year, invading woody species were cut and sprayed. The mowing activity this year will aid in locating and eliminating smaller versions of the unwanted species. 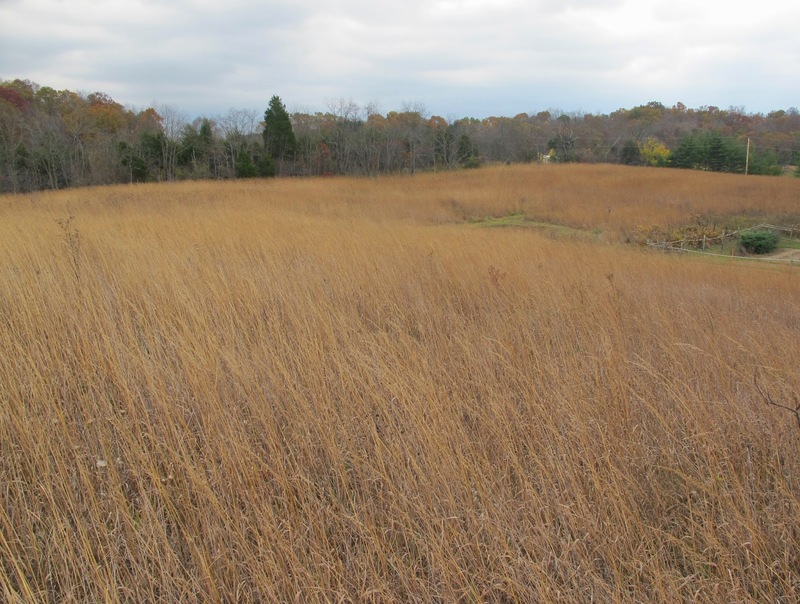 The Indian Grass seed produced in these fields feeds a multitude of wintering sparrows. For this reason, I try not to cut more than one third of the old crop fields in any given year. The area shown to the left of the trail was cut last year. This year’s mowing will be in the field to the right. The cut Indian Grass still yields an abundance of seed. The sparrows seem to concentrate their feeding activity in the cut areas during the fall, a time when the Indian Grass seed is still located at the top of the stalk. 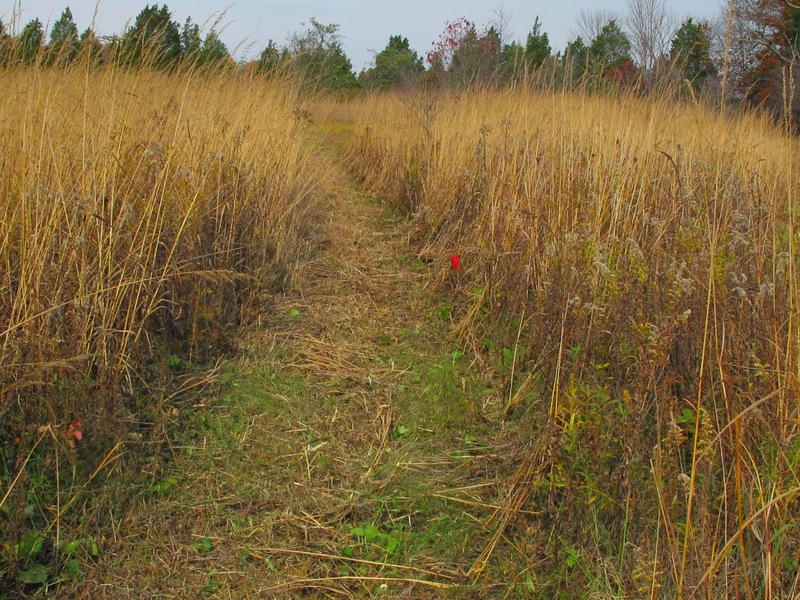 As the season progresses, seed begins to fall to the ground between stalks and the birds forage there. When the ground is snow covered, the sparrows land on the top of the grass stalk and ride it into the snow. There they will work on stripping the seed from the seed head, leaving behind a record of their activity in the form footprints, wing marks and scattered chaff. I am currently preparing the field for mowing. The hardest areas to mow are generally along the field edge. 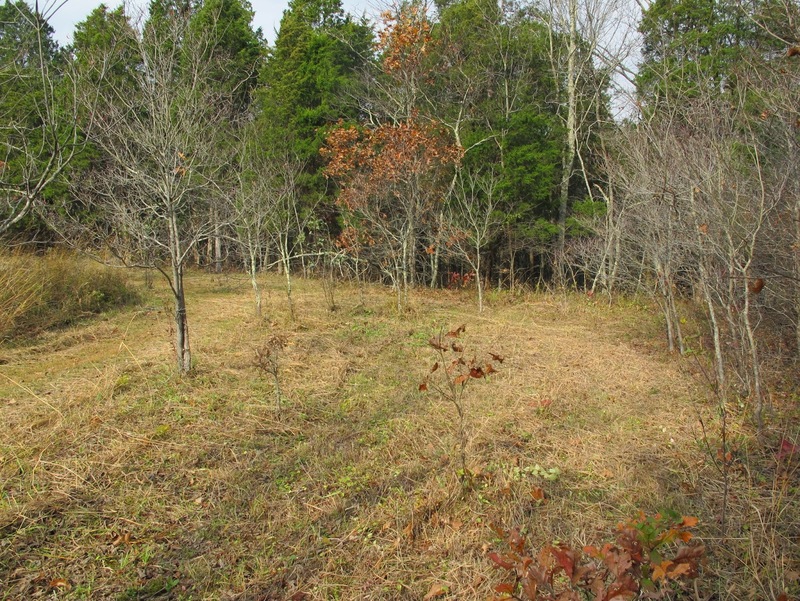 Old dead furrows, fallen tree branches, live tree branches and an irregular path all require that the mower proceed at a slow pace. 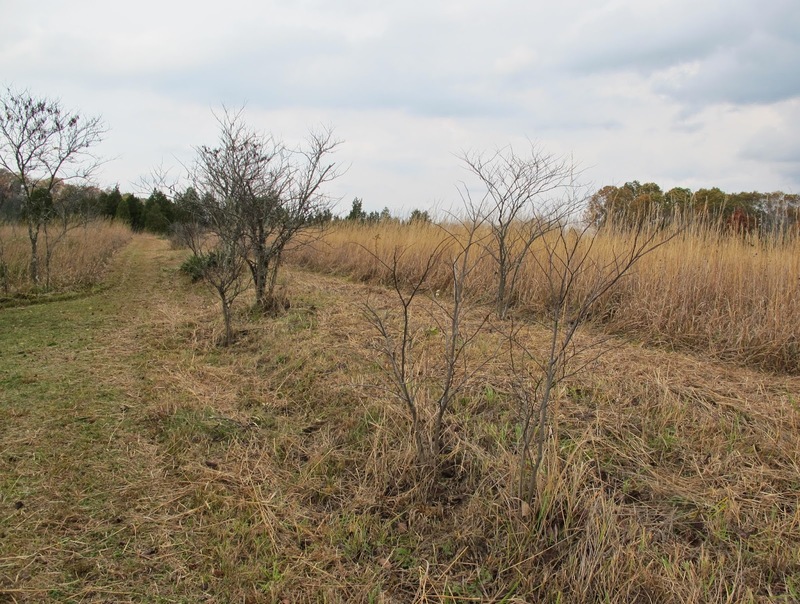 I begin by cutting a straight path several feet in from the field edge and then mowing back in towards the tree line. Straight edges will allow an easier job of mowing the remainder of the field. Corners are mowed in such a way that the remaining field block is left with gentle curves rather than sharp angles. If I do it in just the right way, my final mow will be a long counterclockwise spiral that gradually takes me to the center of the field. 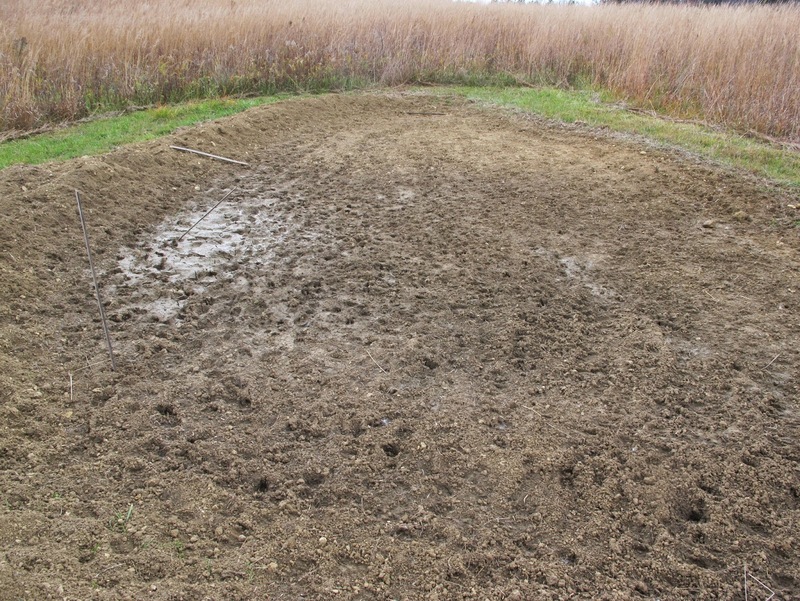 When the field was last cropped, the soil in this corner was so badly compacted that a pool of water was formed that remained long enough to support cattails. 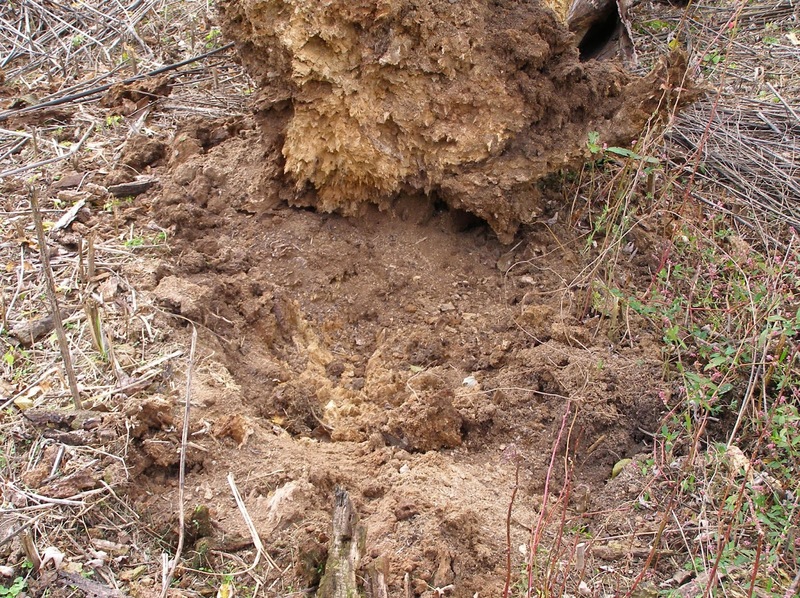 Since then, the soil has restored much of its natural internal structure and water makes its way easily into the ground. Field preparation also includes mowing around several clumps of small trees. 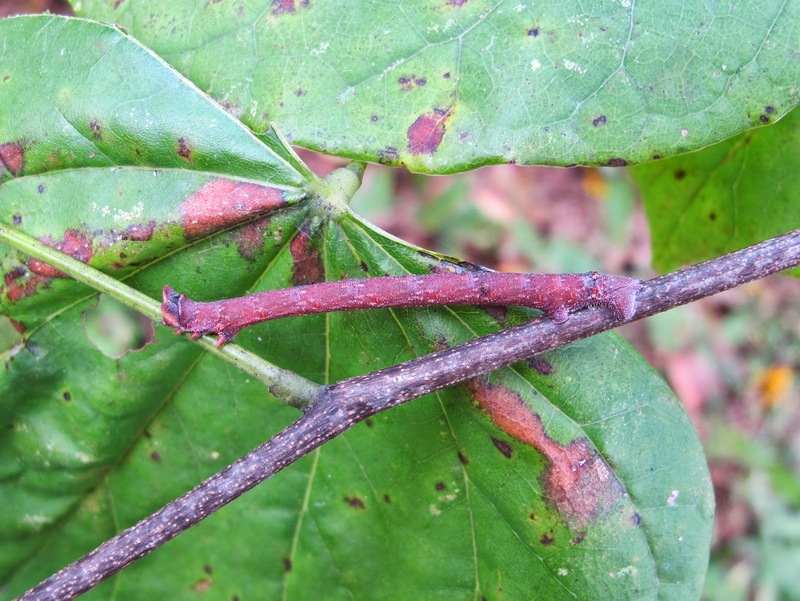 These Redbuds remain here because they are regular hosts for the caterpillars of the uncommon Henry’s Elfin butterfly. 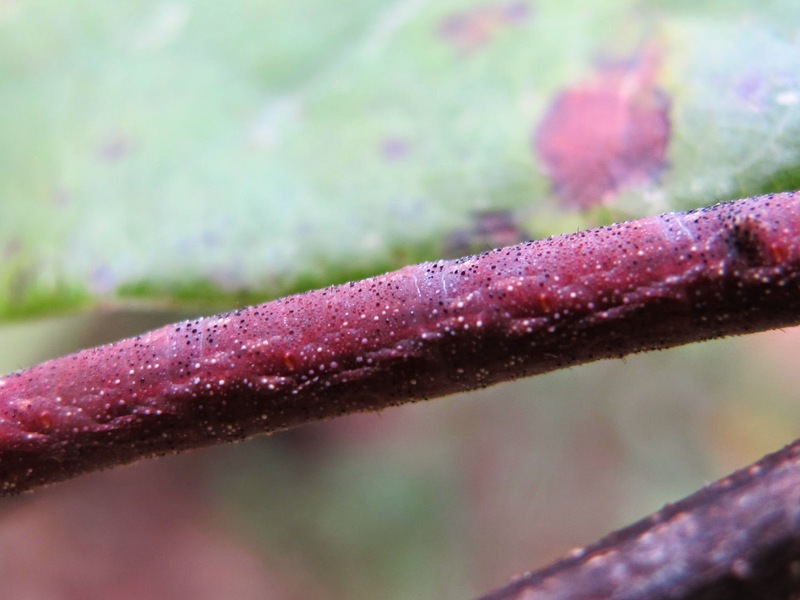 Redbuds are common over the entire property, but the butterflies only lay their eggs in a very few areas. It would have made my job much easier if the Indian Grass had not had such a fabulous growing year. Warm temperatures arrived earlier than normal in the spring and frequent early season rains gave the grass a tremendous boost. The tall grass, in most cases topping out a foot or two above my head, makes it difficult to see obstacles in the path of the mower. The new Toad Pool construction site is certainly an obstacle, but not one that is hard to see. I halted construction in September because the soil was too dry to compact. Then we had five inches of rain during the first two weeks of October. Since then, the soil has been too wet to work. This project will probably be put on hold until next year. Meanwhile, the deer have developed a fascination for the site and have thoroughly tracked up the area of exposed soil. I’ve gone around and marked known obstacles with blue flags. This field contains close to 100 ant hills and I don’t want to run any over with the mower. If they were all the size of this one, I wouldn’t have any trouble. Most are less than two feet in diameter and one foot tall. Something of that size could be pretty well leveled by the mower. 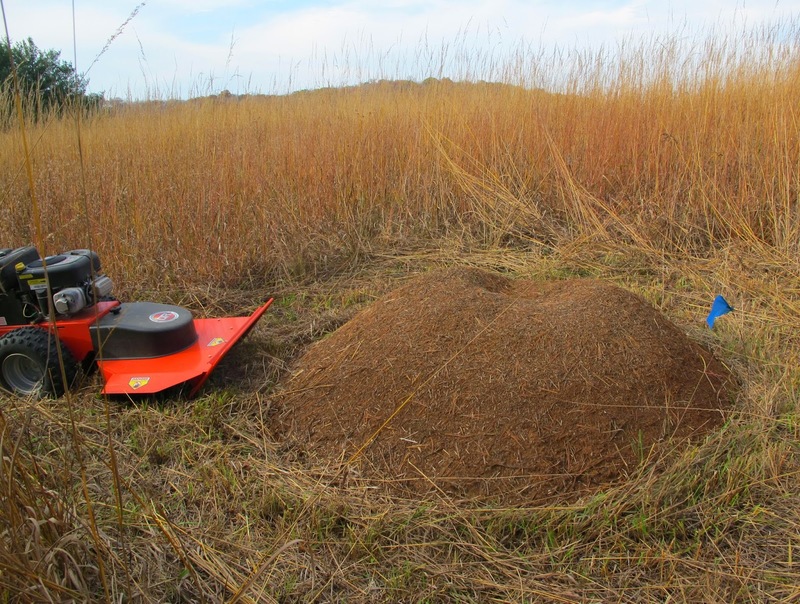 Fortunately, mounds I’ve hit in the past were reconstructed by the ants and seemed not to suffer any long term consequences. If we have average weather conditions, a mound damaged in early November will have its cap back in place in just a few weeks. 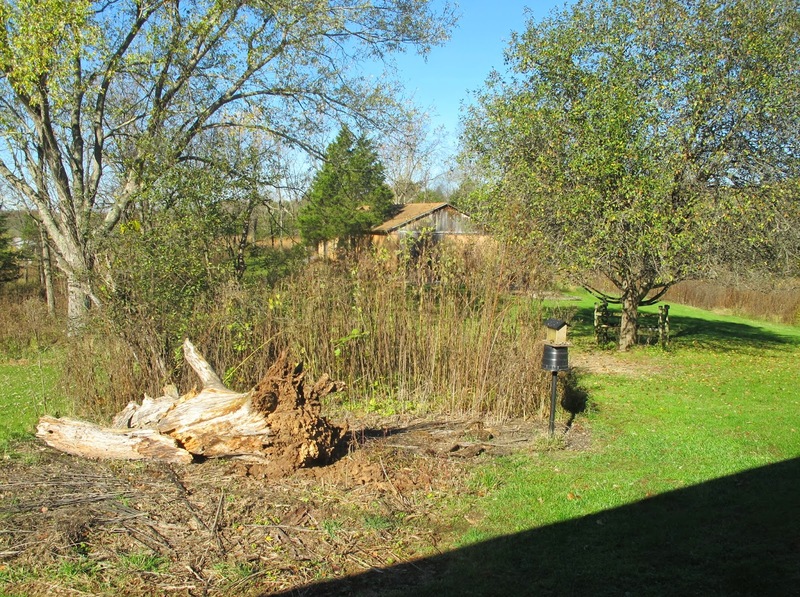 Any undesirable woody plants whacked by the mower are marked with a red flag. I come back at the end of the day, trim the stump down to ground level and spray it with glyphosate. Spraying might be delayed for a day or two if rain is in the forecast. The thick stand of Indian Grass means that I’ll have to run the mower at a slightly slower speed. This is to insure that I don’t miss seeing any of the plants that should be eliminated from the field, which is the reason I do the mowing. I’m looking forward to a time a few weeks from now when I can look at the field and see work completed, instead of seeing work yet to do. 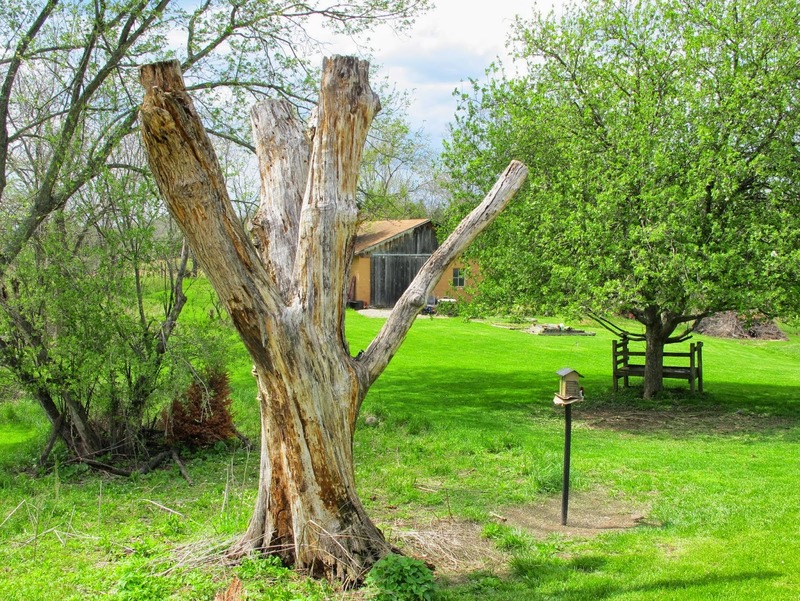 This is how the woodpecker tree appeared in May 2014, the last time it was photographed in an upright position. 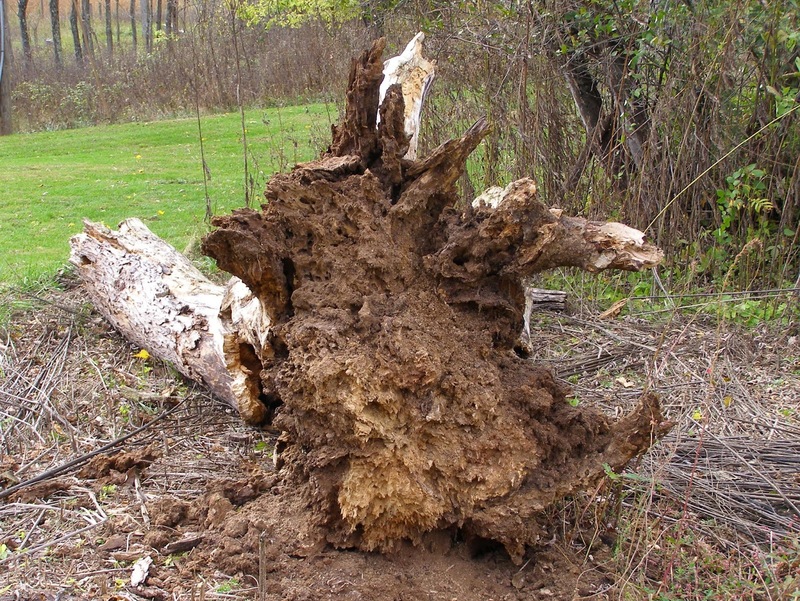 The stout Silver Maple managed to remain standing for nine years following its death in 2005. This is that same view as of today. It’ll be a while before I stop doing a double-take as I pass by the window outside which this large tree trunk once stood. I had the tree cut short enough, so it wouldn’t reach the house if it fell in that direction. Fortunately, it went the other direction and landed in a spot where it can be left to continue its slow deterioration. I had been looking at birds on the feeder just minutes before the tree lost its hold on the vertical and flung itself to the ground. The impact tremor was felt throughout the house. The sound was reminiscent of a quarry blast. 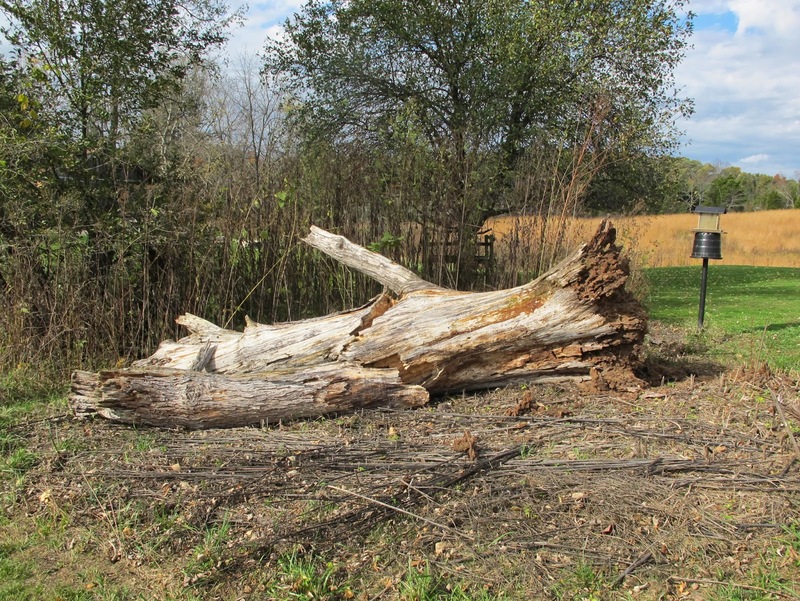 I would have thought nine years of decomposition would have softened the trunk up a bit. The three large branches broke at the point where they forked from the stout base. The tree has securely brought itself to rest and will not be doing any further shifting of position. Despite nine years of weathering, the outside wood of both branches and trunk are still remarkably solid. Even when the tree was alive, the point that branches diverge from the trunk was a weak spot. It’s natural that the breaks would occur here. 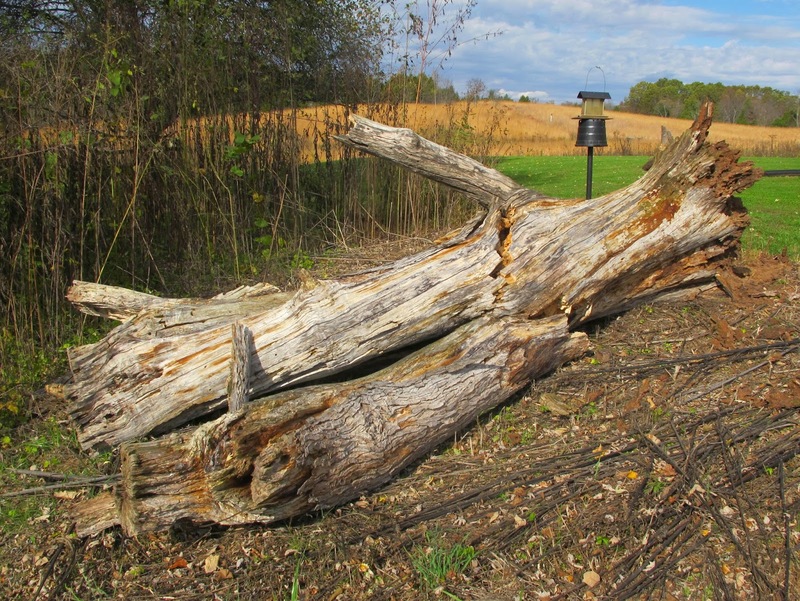 The dead tree has had no shortage of insect residents. 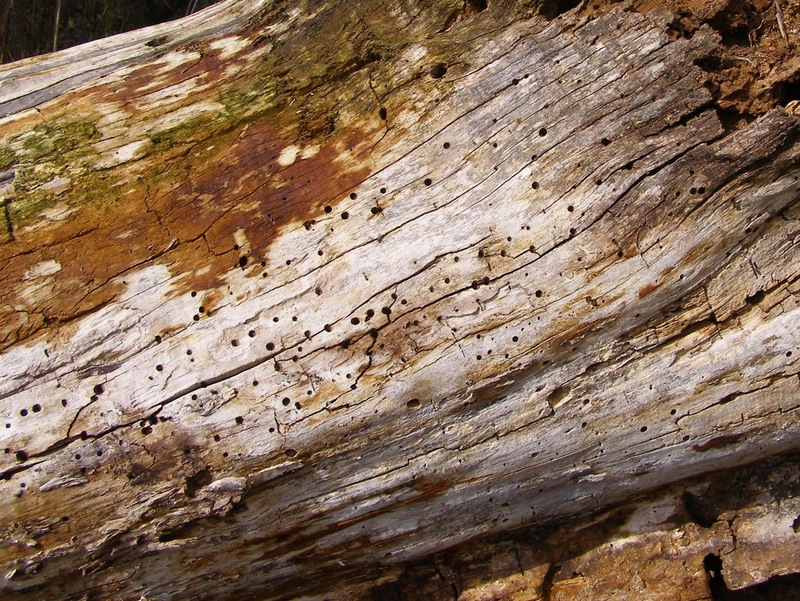 The wood surface is covered with holes created by a variety of wood borers. 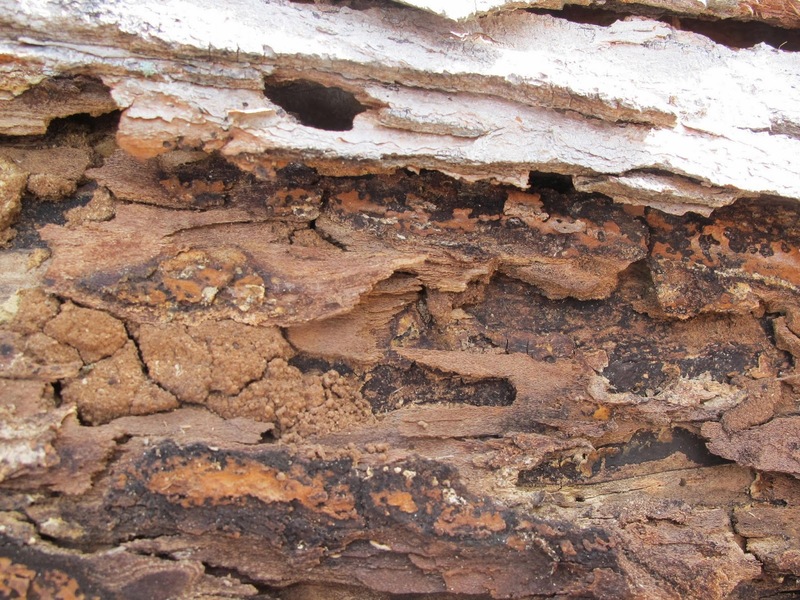 There were only a very few locations where insects had obviously concentrated their feeding activities on wood located directly beneath the bark. 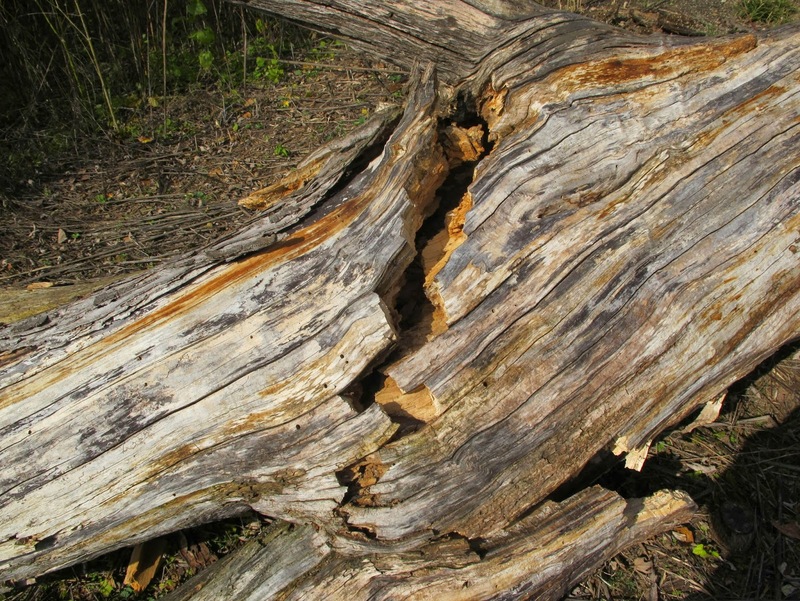 The bark remained securely attached for several years following the death of the tree. I expected to find a lot more signs of insects in this part of the wood. 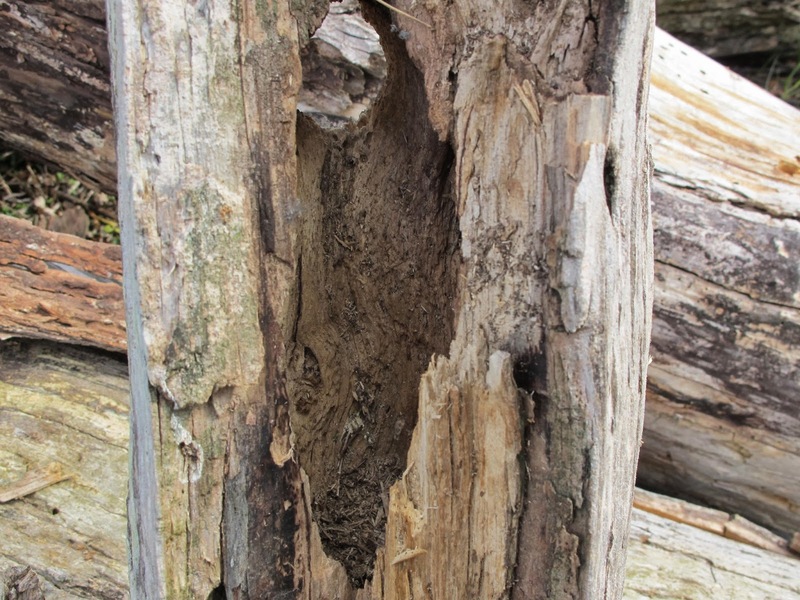 This cavity, found near the top of the smallest diameter branch, fledged a batch of bluebirds this summer. I’m glad the tree didn’t come down during nesting season. Decomposition was more rapid at and below the ground, where fluctuation of temperature and moisture levels was minimized. Had the trunk followed the same pace, there would probably be just a pile of crumbs here now. Side roots disappeared long ago. A small central core was all that kept the dead tree upright. 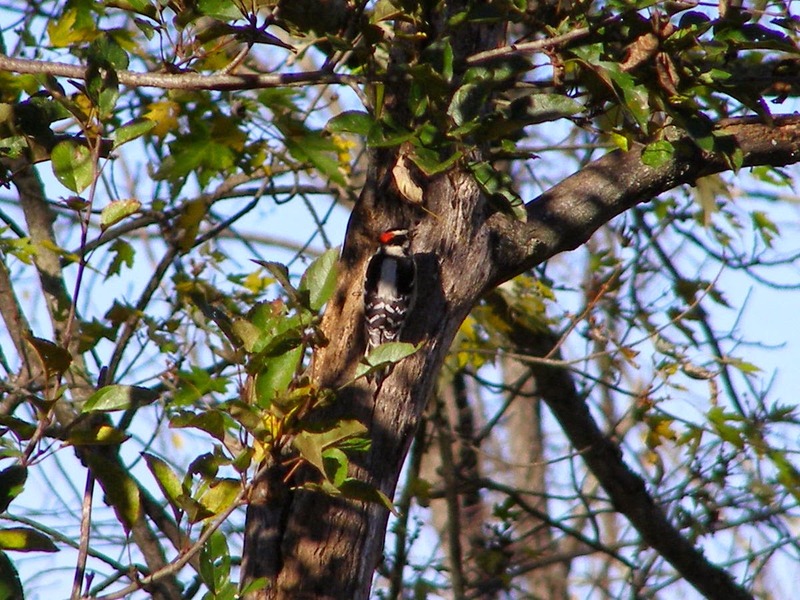 Loss of its vertical attitude has not dissuaded the woodpeckers from visiting the tree. They still probe the cracks and crevices, but seem to have abandoned it as a regular feeding station. Sunflower seeds taken from the feeder are now conveyed to a dead limb on the old apple tree for opening and consumption. I’ll miss watching the adult birds teach their offspring the knack of placing a sunflower seed in just the right crevice so the husk can be easily removed. 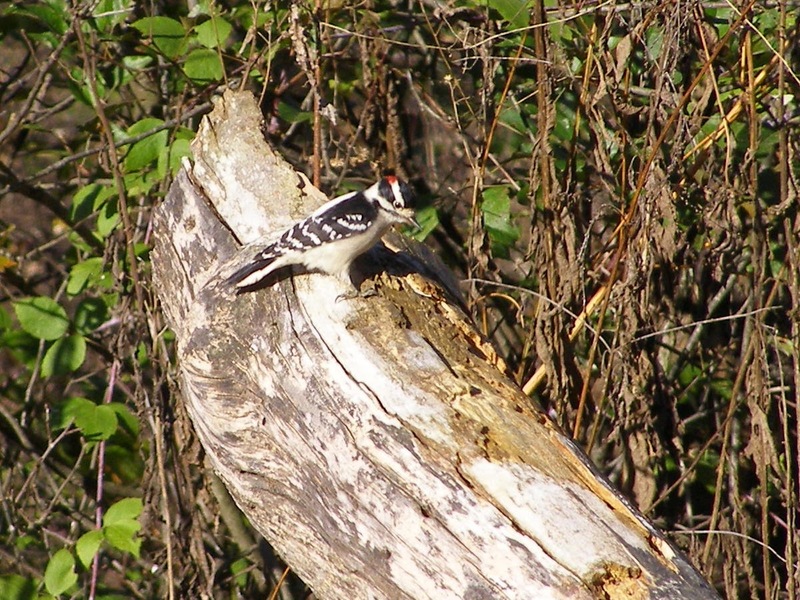 The woodpecker tree may be down, but I’m sure it will still provide plenty of interest for me to observe. Following a three month absence, water has returned to the creek. Gentle precipitation spread over a two week period resulted in a total of five inches of rain falling on Blue Jay Barrens. 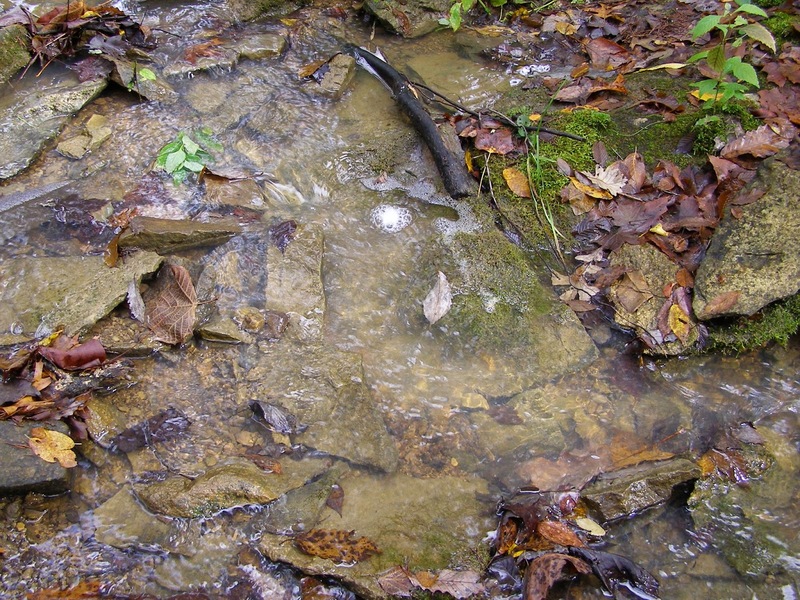 This recharged the ground water enough to cause a rise in the well level and to allow water flow through the creek channel. Most of the aquatic life has yet to become active, but the pools are full and shallow riffles sparkle in the sunlight. It won’t be long before the creek animals reclaim their domain. The water flow is still below its wet weather norm. 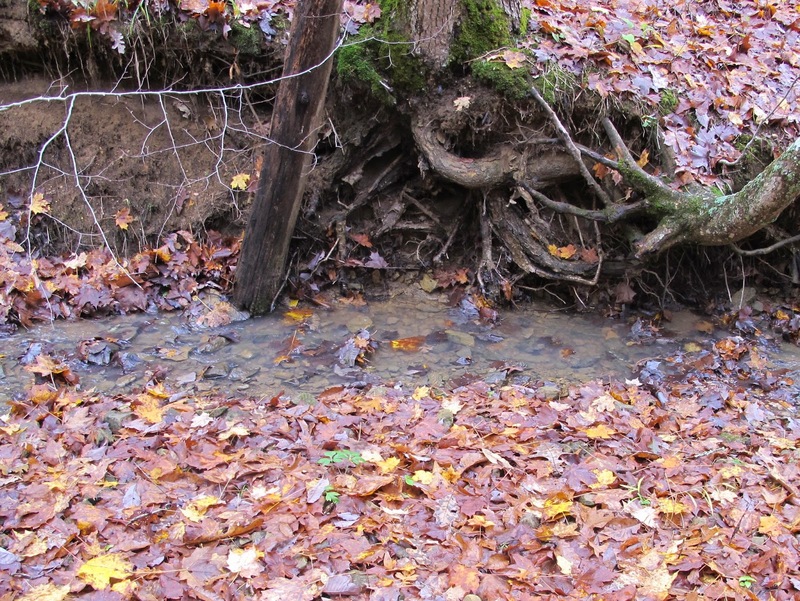 The rate of flow suggests that the ground water has been recharged sufficiently to maintain a stream flow until the wet weather does arrive. The rain fell at a slow enough rate to allow practically all of the water to penetrate the ground rather than run overland to the creek. Leaves in the channel lay undisturbed except in the lowest part of the channel where the water flow originated. 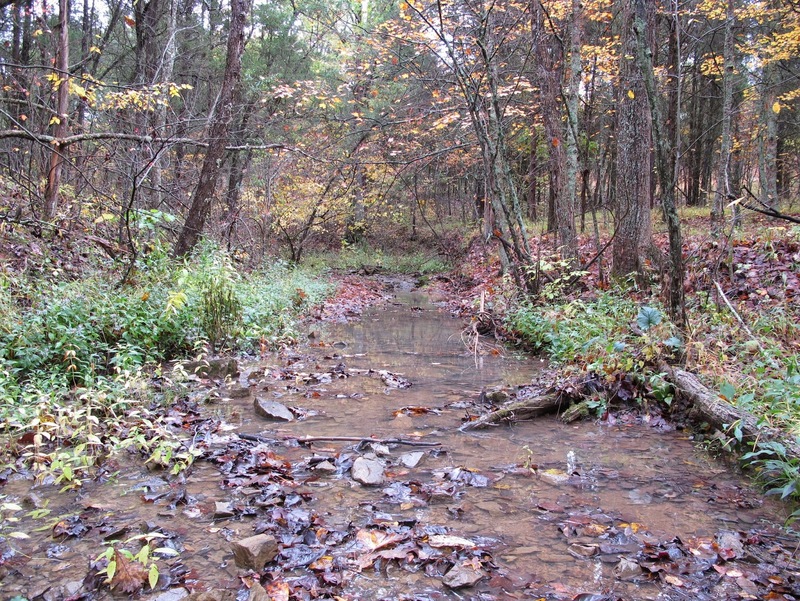 The upper portion of the creek channel is more entrenched and has a steeper grade than the wider channel downstream. This generally results in a more rapid water flow. Even in these reaches, the water flow was so slow that leaves in the water were not carried away. 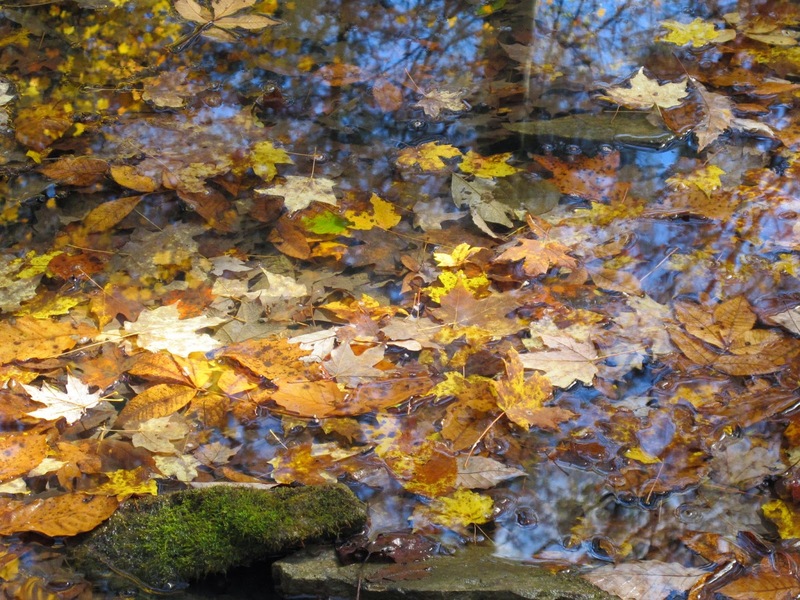 Decomposing leaves are a prime source of energy for organisms living in headwater streams. 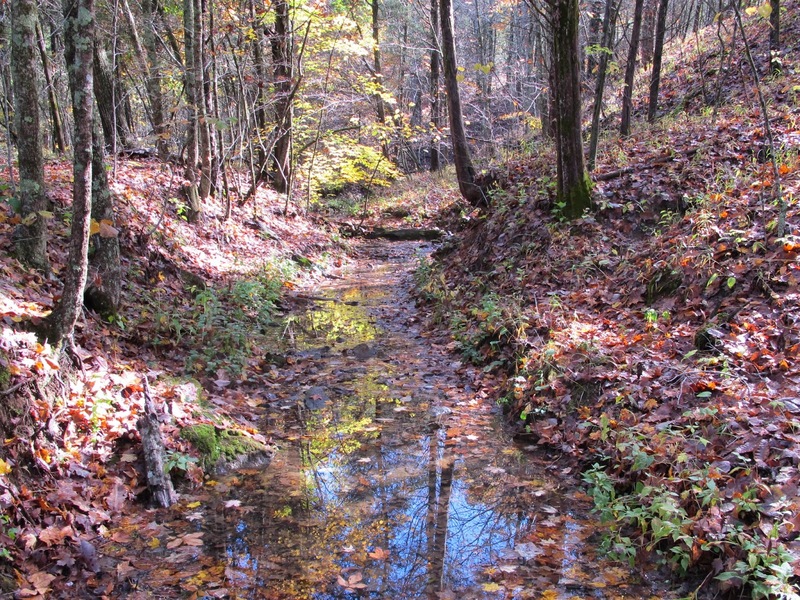 The longer the leaves remain in place, the more benefit they are to the stream ecosystem. In years where the leaves are not washed away by flood waters, there is a noticeable increase in stream insects and other organisms. Reflections of sky and trees on large bodies of water usually result in an attractive image. Reflections on a small creek are often less appealing. 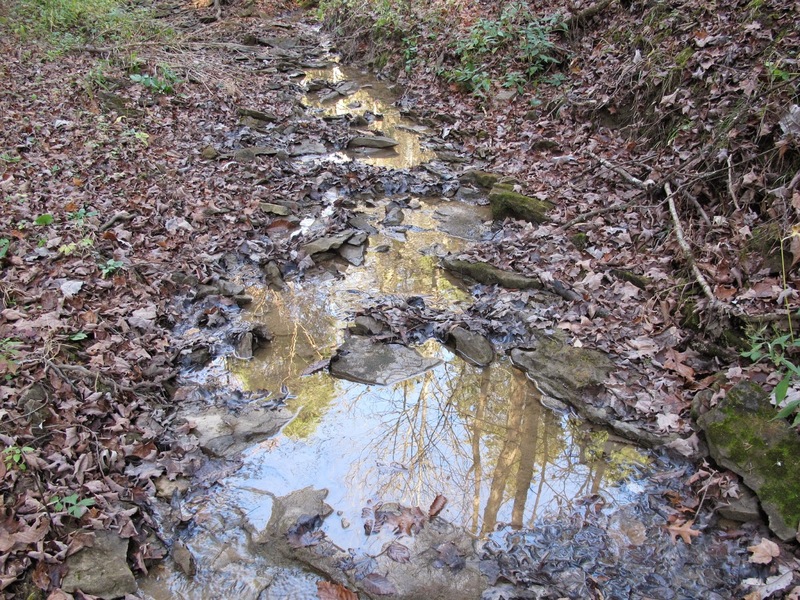 The green and yellow leaves reflecting on the water make this creek appear to have acid mine drainage or similar contaminant fouling the water. A colony of Coltsfoot, Tussilaga farfara, has become established on the toe of this bank. 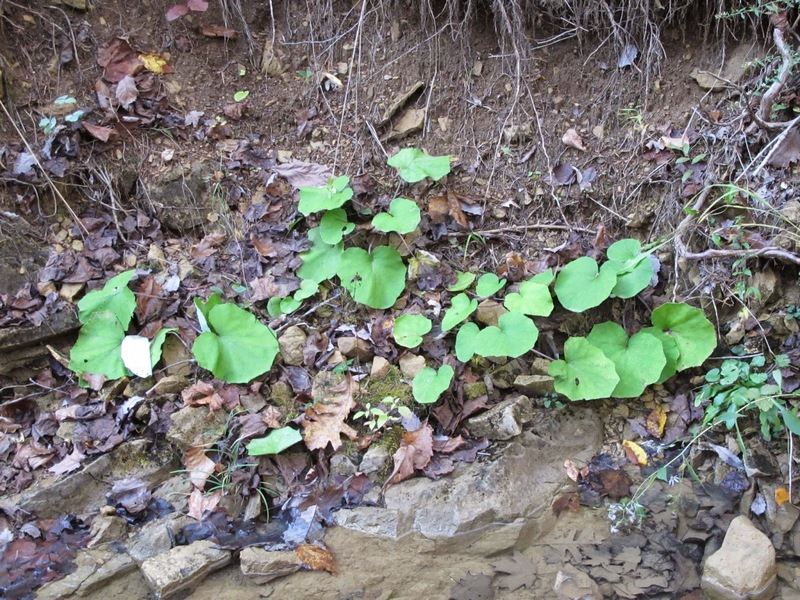 Coltsfoot is a non-native that can form dense colonies on gravel bars and creek edges. I always remove it when I find it, but seed from upstream continues to bring me new colonies. Flood water hasn’t yet come close to reaching the bottom of the new bridge. The support beams sit just above the record flood level for this stretch of creek, so it’s going to take a flood of disaster proportions to cause any damage here. 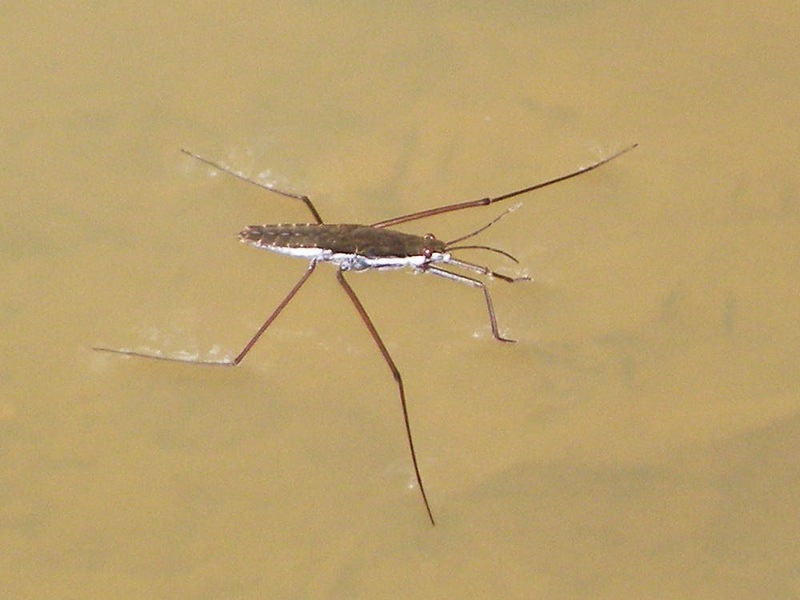 Water Striders were quick to reclaim the surface of the newly filled pools. 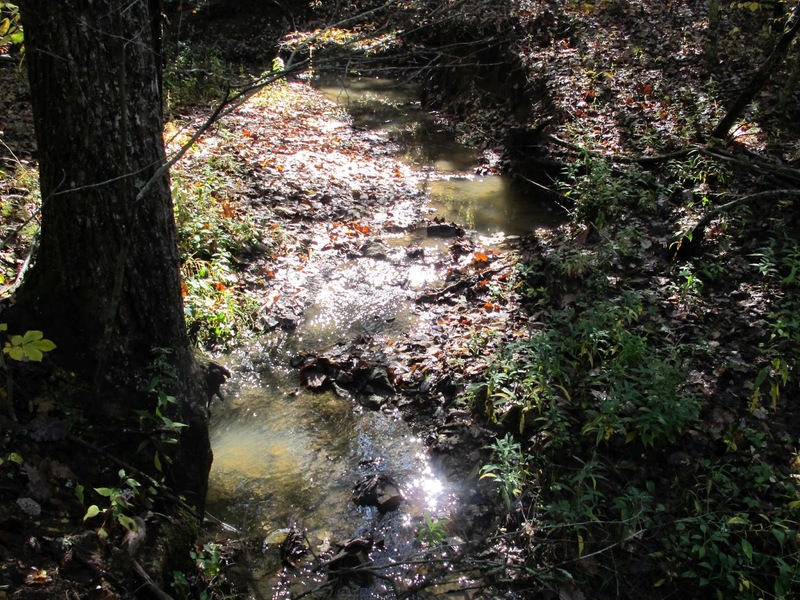 When the creek is dry, the Water Striders shelter beneath flat creek rock in the channel or beneath vegetation on a moist bank. They emerge from hiding as soon as water appears. 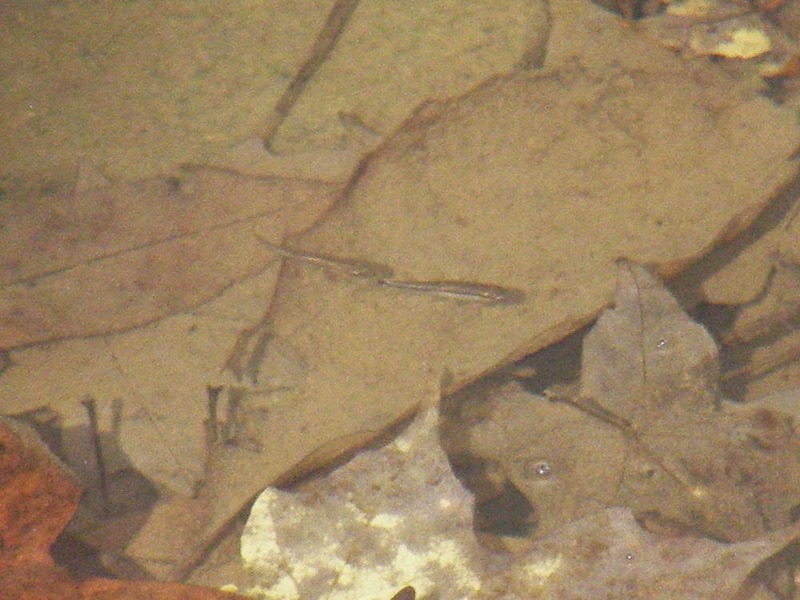 The only fish left in the creek in early summer are the recent hatchlings from the spring spawn. 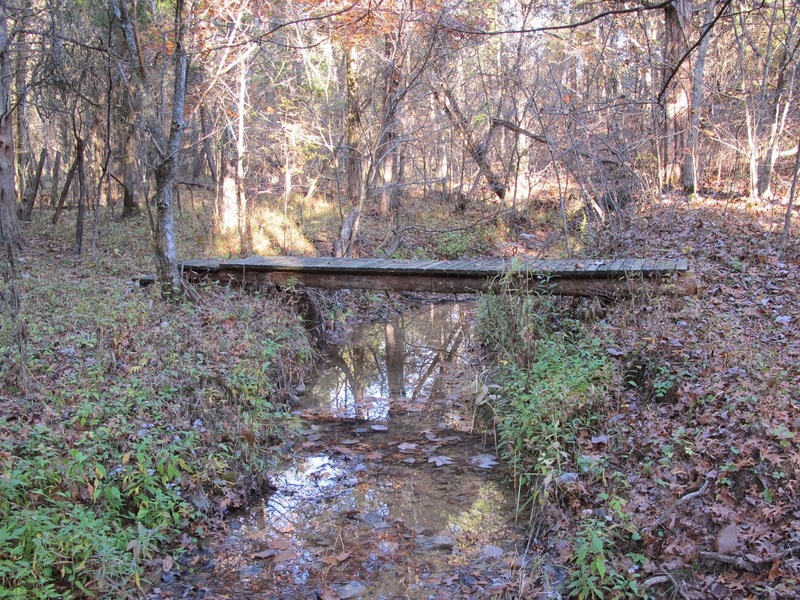 Most of those perish when the creek pools dry up in July or August. A lucky few manage to end up in the one pool that holds water in all but the driest of years. Now considerably larger than they were a few months ago, they will begin to spread out along that section of creek. It’s always a good feeling to have the water return to the creek. I was passing a group of small Redbuds growing in a sheltered place beside the garage, when I noticed a triangle shape in the foliage. The sight of a shape not naturally produced by growing stems caused me to stop and examine more closely. I found this looper type caterpillar apparently beginning a journey up a leaf stem. 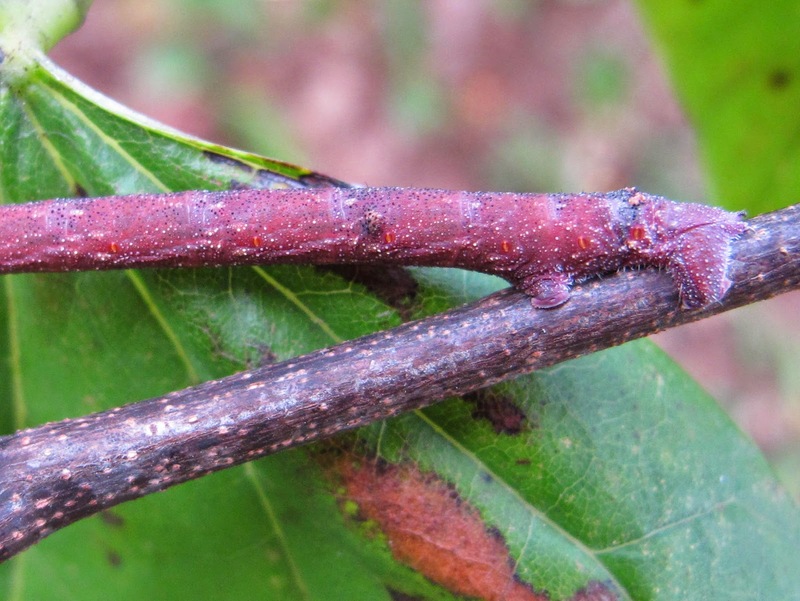 It doesn’t matter how well you mimic a twig, if you put yourself into an untwig-like position. The caterpillar possesses a remarkable camouflage. 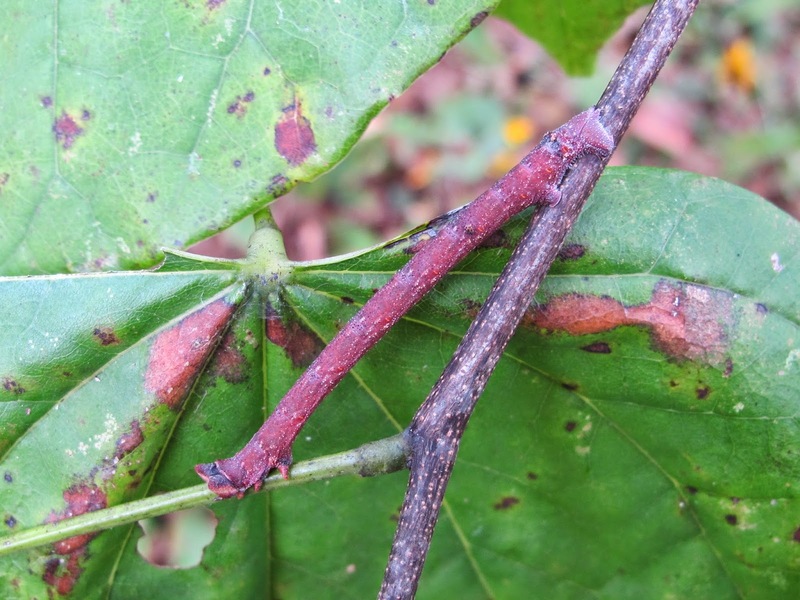 Body form, color, pattern and texture all match components of the actual twig. 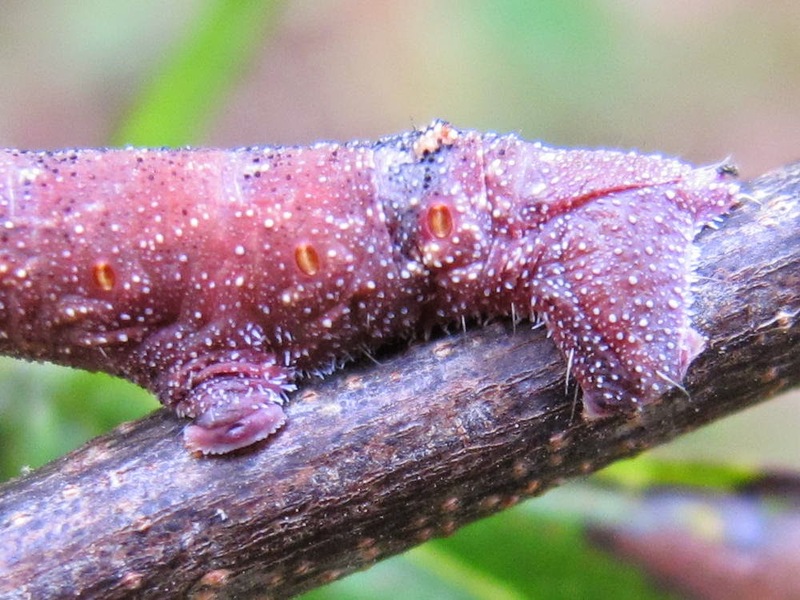 The two conical projections on the head help to identify this as a Cleft-headed Looper, the larval stage of the Pepper-and-Salt Moth. The projections remind me of terminal buds and play a part in the twig mimicry. Located behind the head are three pairs of legs. 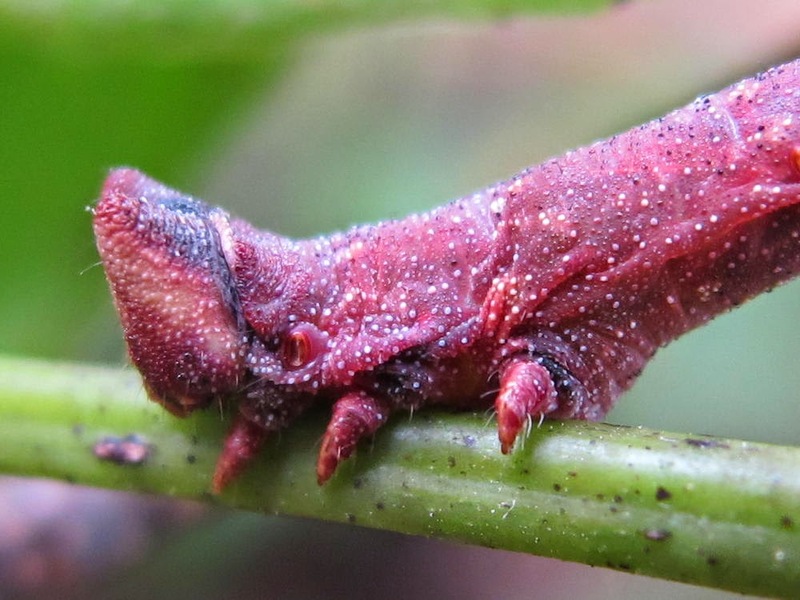 Caterpillars sometimes appear to have many legs, but these six are the only true legs. At the other end of the body are leg-like structures known as prolegs which are short, hook tipped appendages used for gripping. It’s not uncommon to hear a tearing sound as the ends of the prolegs are pulled from the substrate, especially if you are removing caterpillars from your clothing. The hooks work in the same manner as those found in Velcro. 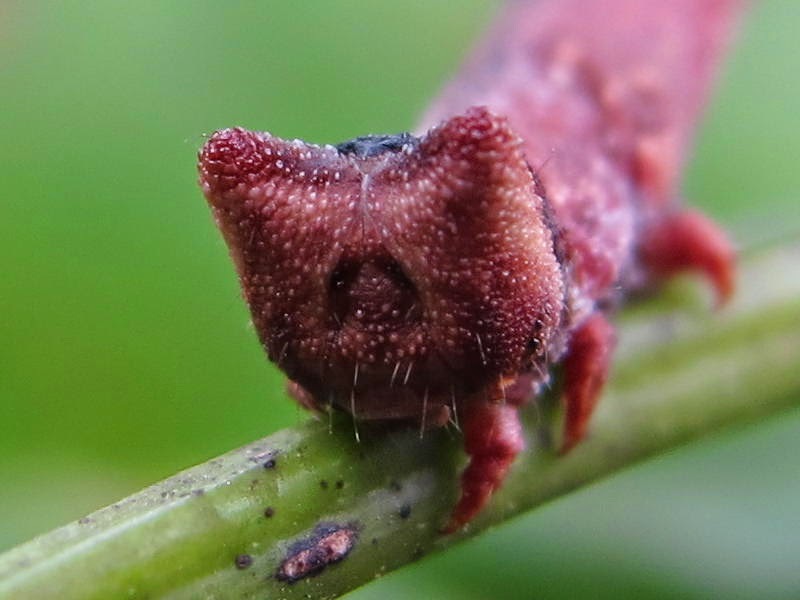 Looper caterpillars lack prolegs in the center portion of their bodies. They travel in typical inchworm fashion by extending the body until the front legs get a firm grip and then bringing forward the rear end by arching the body into a loop. Hopefully, this fellow got where he was going without attracting any predator attention to his triangle pattern. It would be best if it just stopped forming these abnormal shapes. Of course, this species is in the family Geometridae, so it’s to be expected that this guy would know a little something about Geometry. 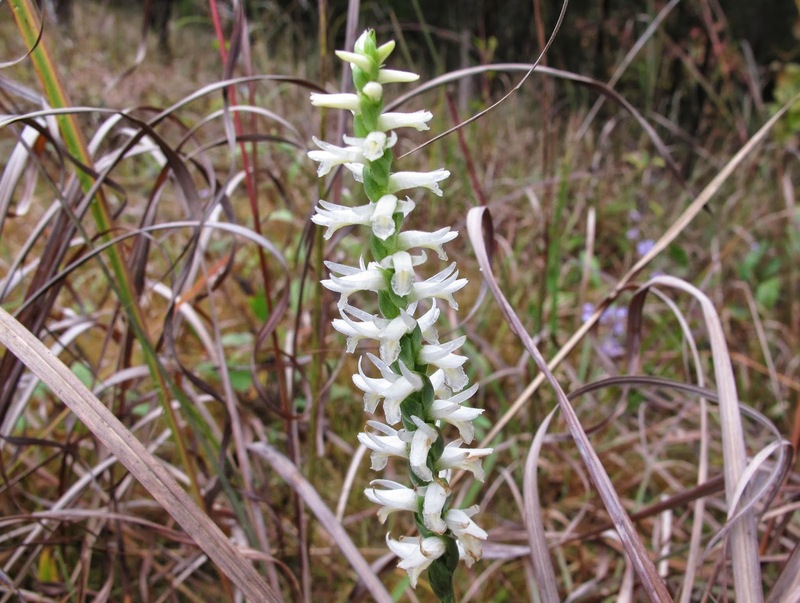 I was sorely disappointed when I went back to check on the group of Spiranthes magnicamporum orchids that I found a couple of weeks ago. A short stalk was all that was left of the largest of the flowering plants. Evidence of browsing Whitetail Deer. Six of the 14 blooming plants suffered this fate. All were within a few feet of the trail that is used by me and the deer. Other plants that were farther from the trail were left alone. This shot was taken from the trail. 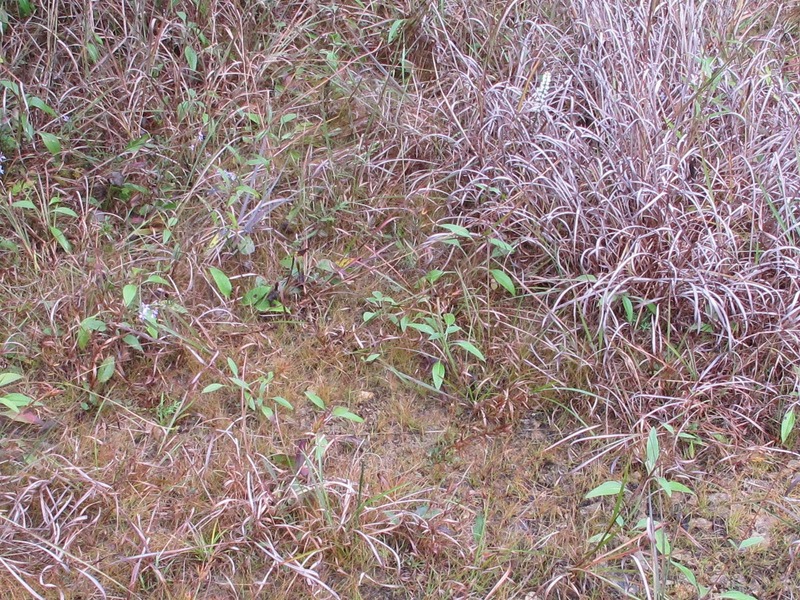 The stalk of the eaten plant is in the center foreground. 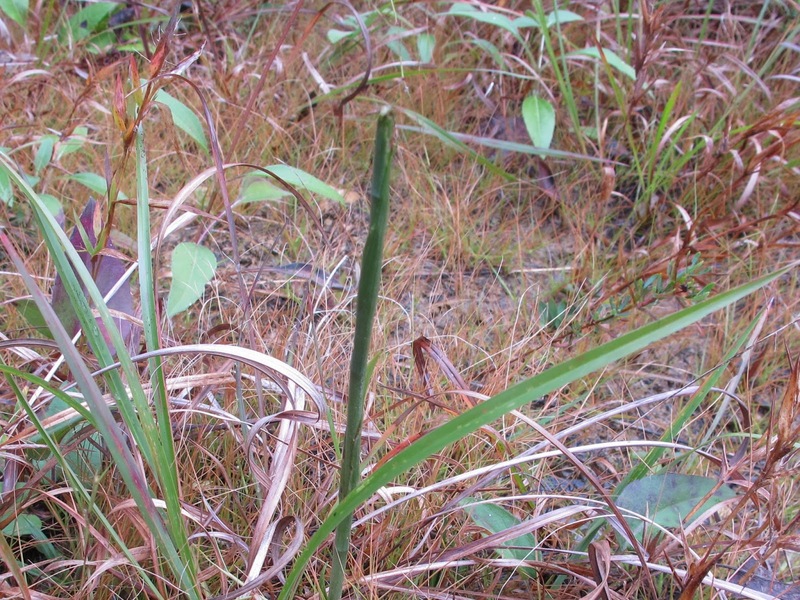 The flower spike from another plant can be seen emerging from the clump of brown grass in the upper right. Distance between plants is about four feet. 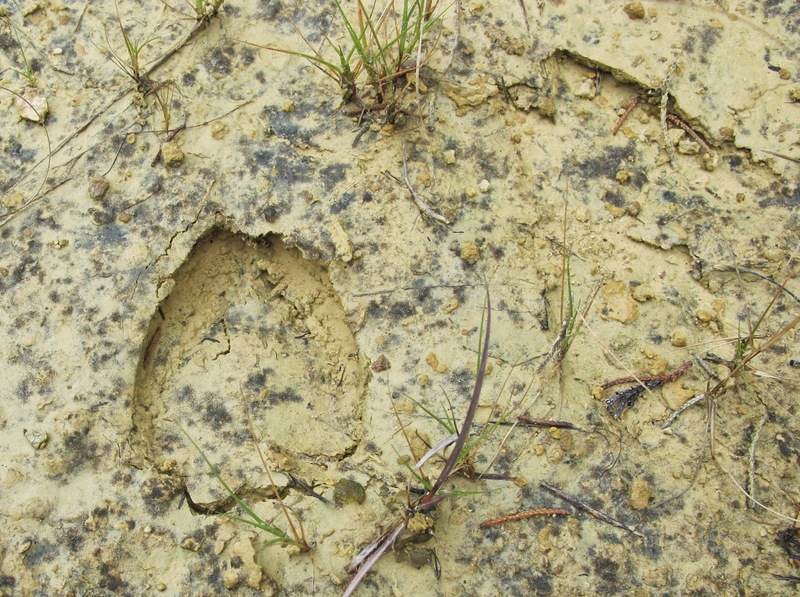 Each of the eaten plants had a set of arrow shaped hoof prints pointed to what was left of the flower stalk. Deer have a taste for orchids and many orchid species that were once common here, such as the Showy Orchis, have not been seen for many years. Loss of a few flower spikes was just the first disappointment. I had come out in hopes of witnessing insects pollinating the orchids. In two hours of watching I didn’t see anything come near those flowers. 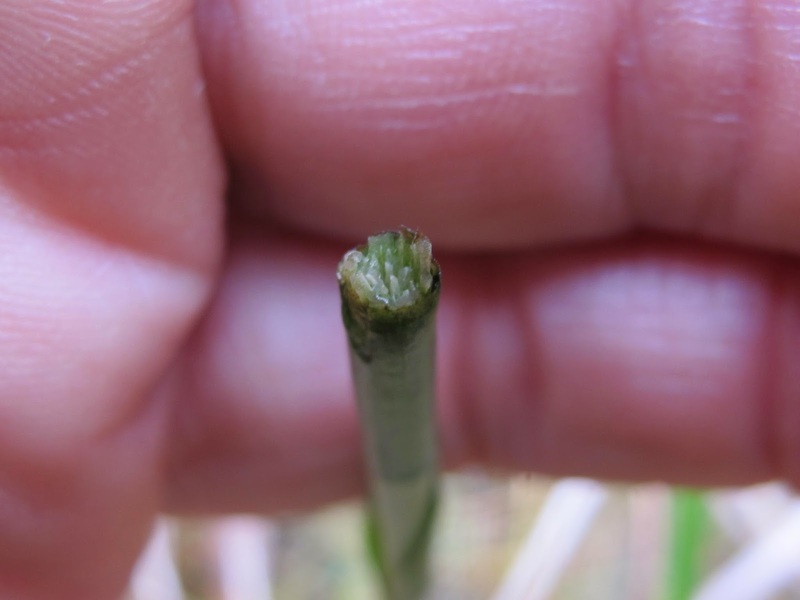 Before leaving the site, I fashioned a pollinating tool out of a dried grass stem to mimic what happens when a nectar seeking insect inserts its head into one of these tiny flowers. 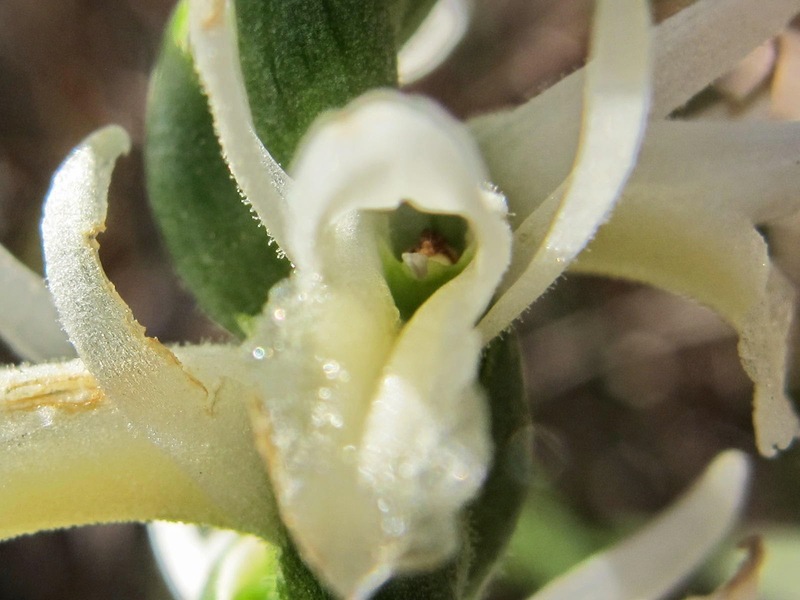 Instead of being released as loose grains, orchid pollen is contained in a sticky mass called a pollinium that attaches itself to a nectaring insect. 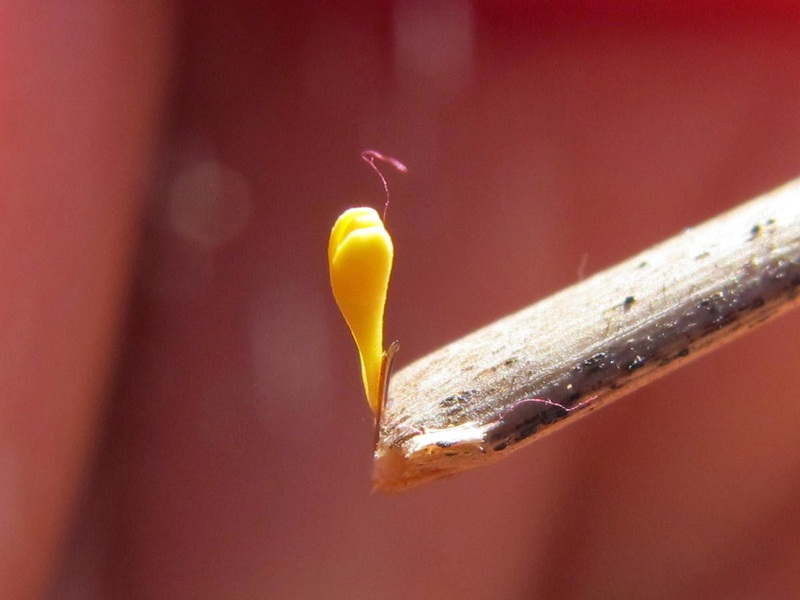 If this grass stem had been the head of a bee, the pollen mass would have attached to the bee’s head. The pollen would then be in position to pollinate future flowers visited by the bee. I have yet to see this activity performed by a live insect. I may just have to pack up and live with the orchids some summer. 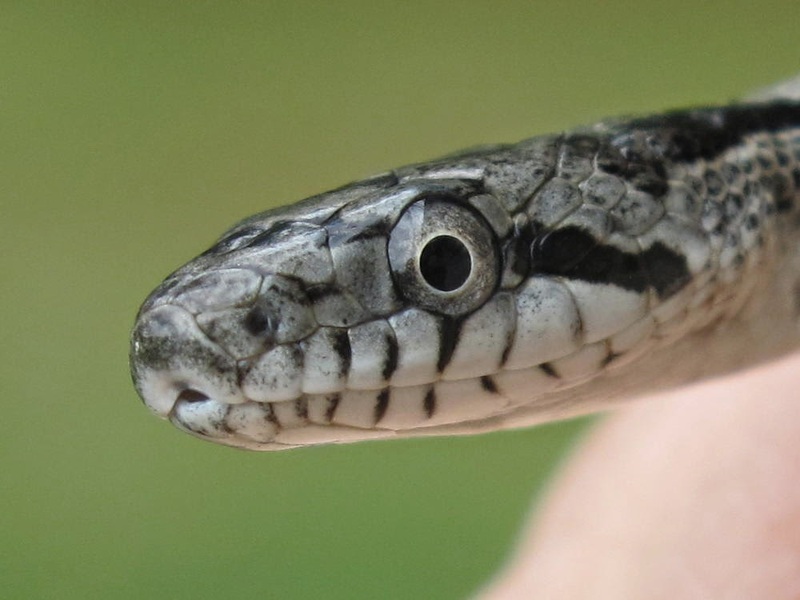 My house, barn and garage are home to many Black Rat Snakes, but until now, I’ve never seen a first year youngster. This fine fellow gained entrance to the house when I left the door to the garage open while I carried some items out for storage. I came in to find him scooting across the family room carpet and quickly moved to intercept. The house is not a snake friendly environment and I would hate to find one like him dead and dried out on some future date. 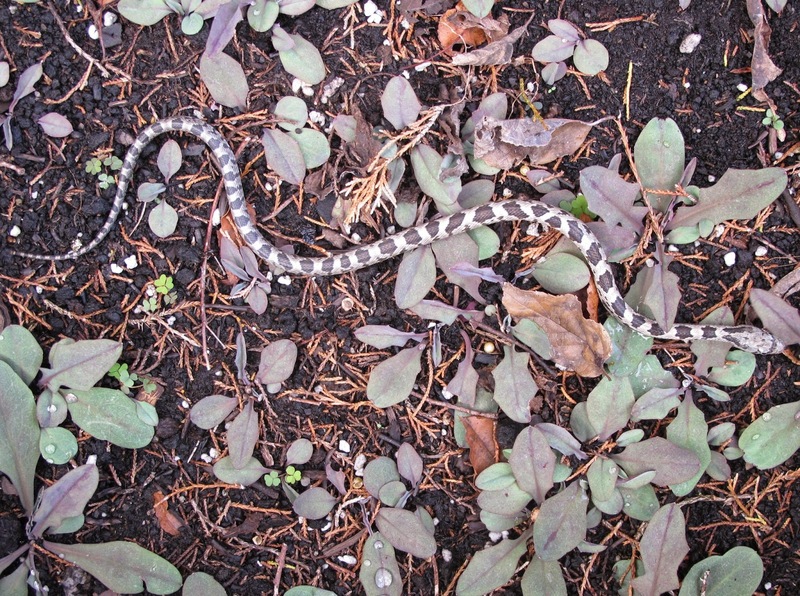 Young Black Rat Snakes are often mistaken for Eastern Milk Snakes. 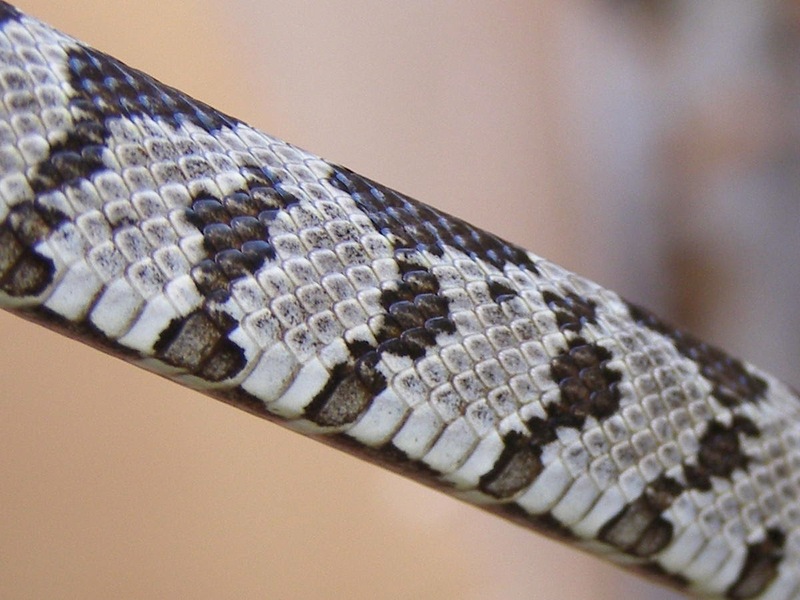 The Milk Snake shows a light “Y” shaped pattern surrounded by dark coloration that is clearly visible just behind the top of the head. 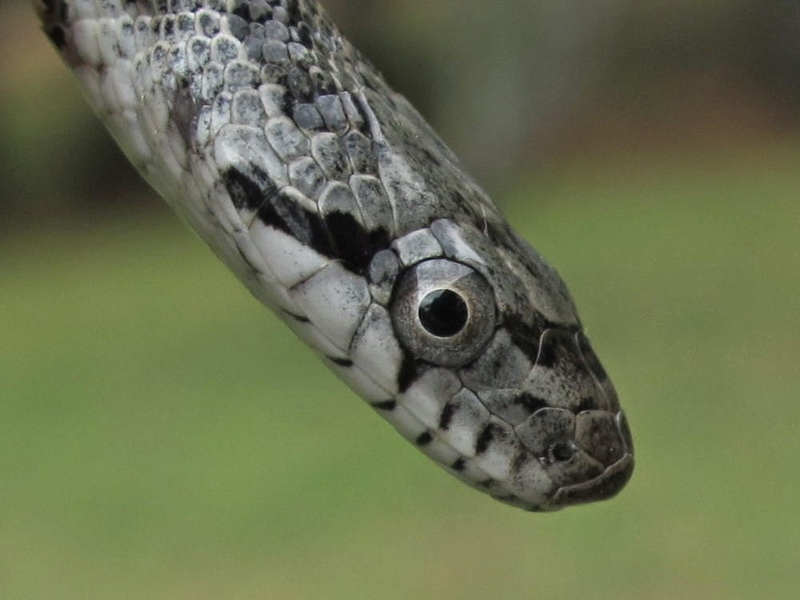 The Black Rat Snake has a gray “V” that blends into the gray on top of the head. 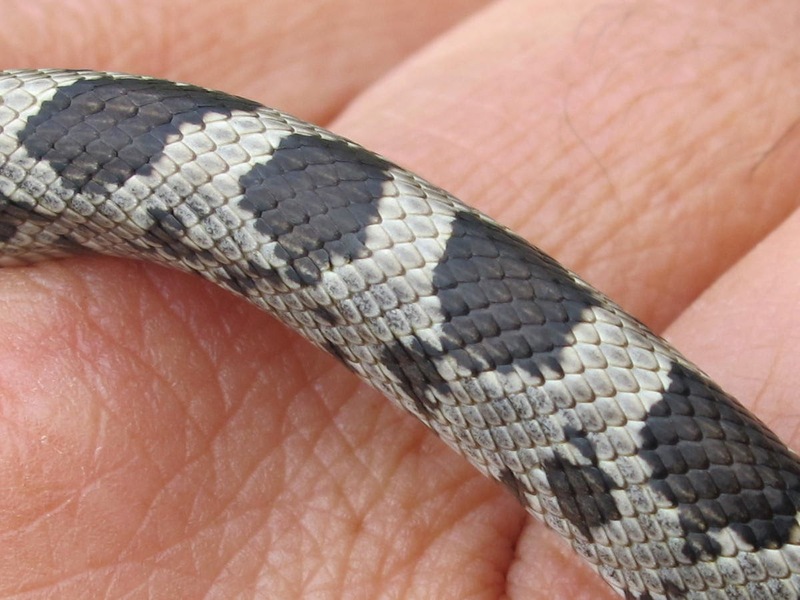 A black stripe begins behind the eye and ends when it reaches the corner of the mouth. The back is marked by a series of dark blotches. 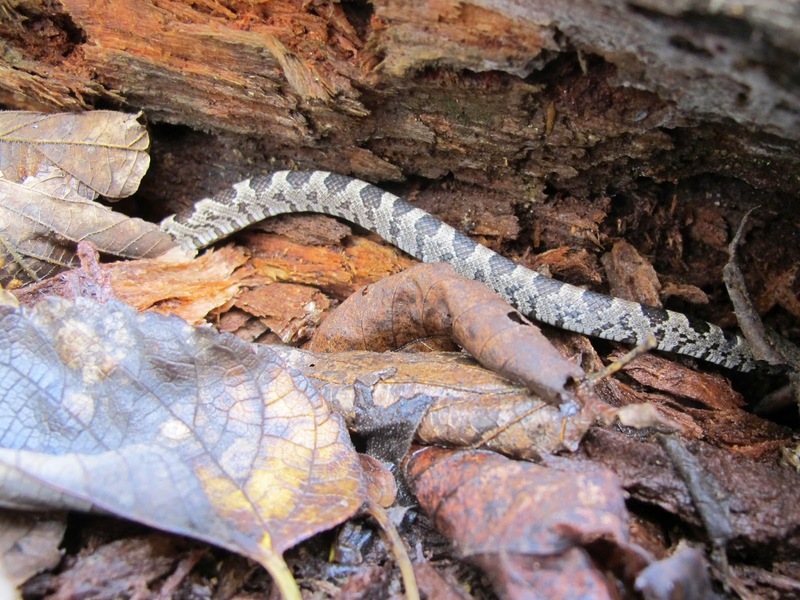 The coloration of the young snake bears little resemblance to that of the adult. 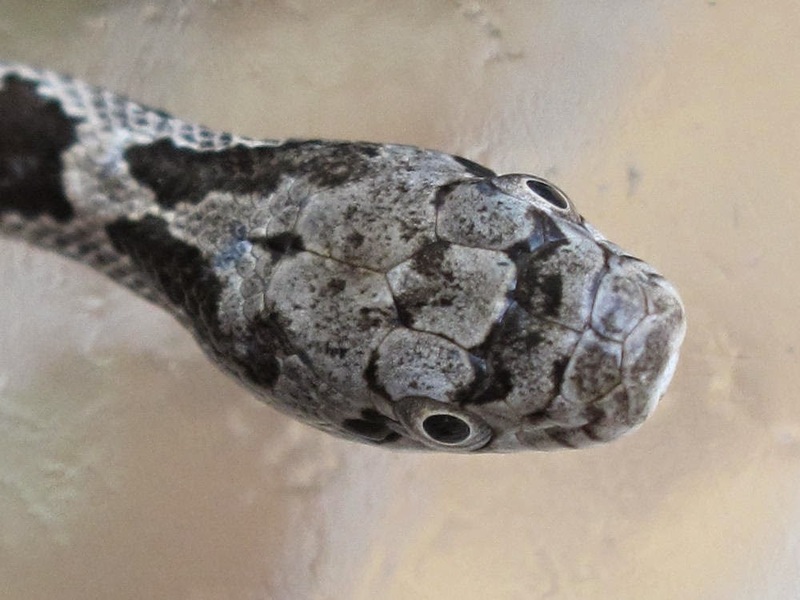 The pattern changes to an almost solid black as the snake grows. Broken vertical bars mark the sides. The body shape reminds me of a train tunnel. 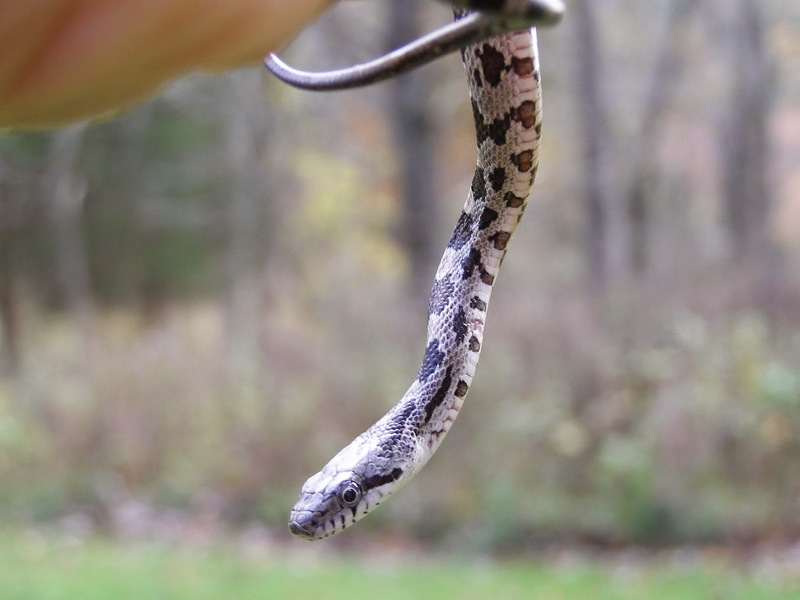 Flat belly, straight vertical sides and a rounded back characterize the Black Rat Snake. A double row of dark blotches runs down the belly. 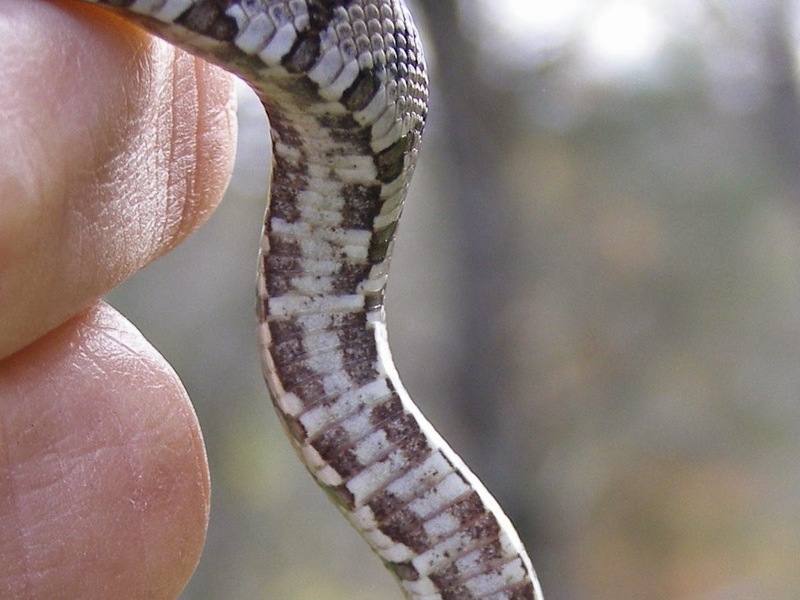 Overall, this is a very handsome looking snake. 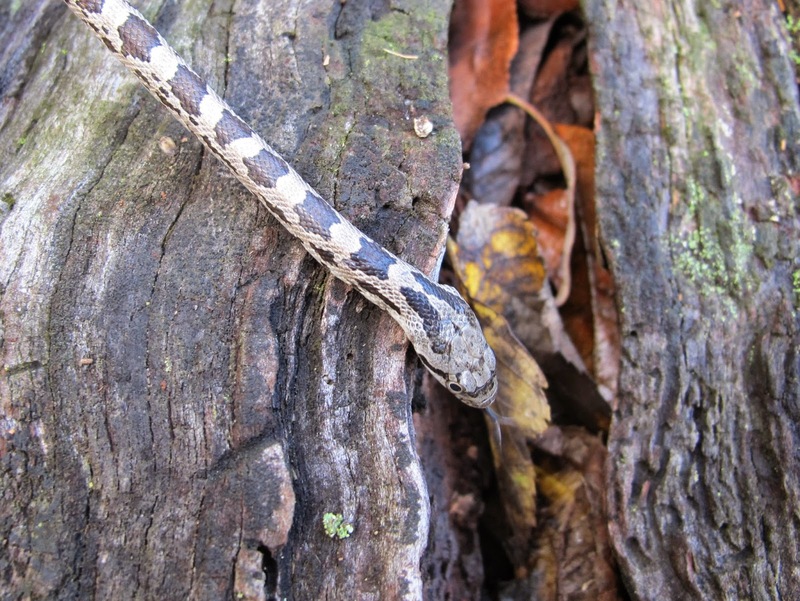 The snake was quite docile, but by the time this shot was taken, it had warmed up enough that it wouldn’t stay still for any more photos. I let the snake down into one of my growing containers to keep it confined long enough for a full body shot. This guy is probably not more than a month old. Then I let the snake go in a brush pile near the house. The pile contains large rotting logs that will provide security from predators while my scent dissipates from its body. I’ve noticed several animal species, especially dogs, that are attracted to the scent of humans. I wonder if handling wild animals might put them at greater risk from these predators. 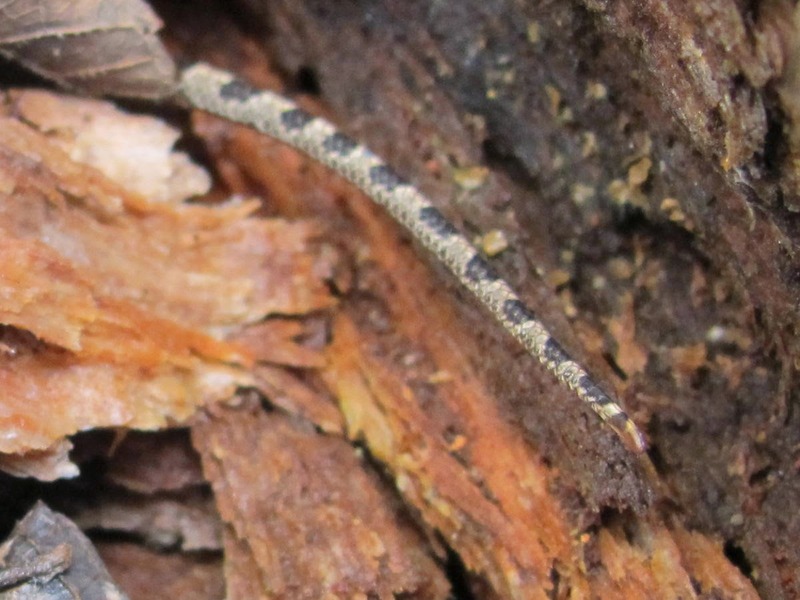 The snake wasted no time moving down into the pile of logs. I may run across this snake again, but for now, that’s the end of this tail.